Around 6:30AM a blaring car alarm woke everyone in the motel. Karen thought it sounded a little close so she opened the door and sure enough it was our car. My “key” was on the TV stand on the other side of the room. I didn’t know how or who activated it but I jumped up and silenced it immediately. I heard the wind howling mercilessly outside and discovered it brought the 52 degree F morning temperature down considerably. As we went to breakfast a young man came in and commented, “What’s going on? I drove 2000 miles for this crap?” He also mentioned the idiot with the car alarm earlier. It was a slower, simpler time before the Interstate changed the pace of America. Back then, Route 66 was the Main Street of America and today Arizona is home to the longest original stretch of that road. Route 66 is a symbol of America’s ingenuity, spirit and determination. It represents a treasure chest of memories. It is mountains and deserts and plains and forests – a flickering neon sign at a late-night diner. Known as the Mother Road, it is today the world’s most famous highway, even though officially it no longer exists. The original route is difficult if not impossible to find in some areas. One sign of the ghosts of the highway is the rickety rows of telephone poles. Another is the railroad. Typically the original Route 66 shadowed the existing tracks. In Arizona difficult terrain posed challenges for the road builders then for the motorists who followed. 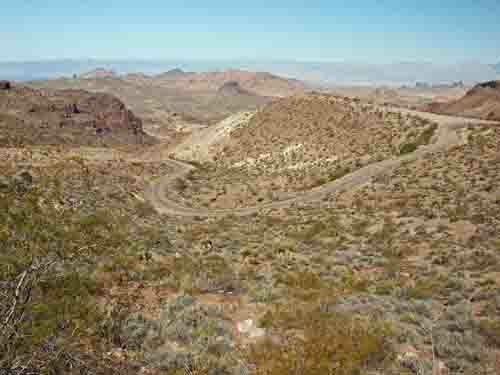 It wasn’t until the reworking of the grade on the Ash Fork Hill near Williams and the bypassing of the dreaded road to Oatman that travellers could motor from border to border through Arizona. 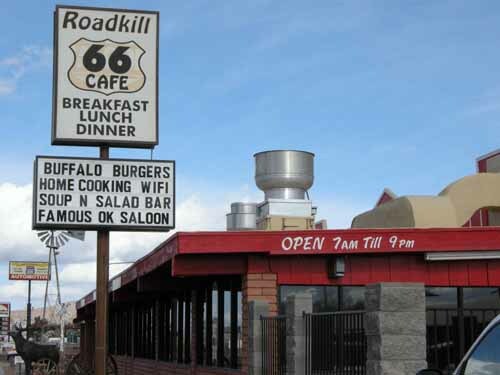 We decided not to start right in Williams where we were staying but to take the interstate to Seligman and pick it up there – I mean really, the Roadkill Café?. I had no idea how long it might take to get to Kingman where we planned to spend the night so I wanted to give us a good chance. My past experience on the highway had been that it could be slow going due to all there was to see. I was fascinated with it in Missouri in the mid-nineties then again in Illinois in 2010. The Mother Road draws me under its nostalgic spell. As we arrived in Peach Springs our perfect weather record came to an end as the cold and wind of early morning brought heavily overcast skies along for the ride. The old gas station in town dated back to the 1920’s but progress had come to Peach Springs in the form of the new Hualapai Lodge. We stopped there for a nice hot coffee to go. What a wonderful idea – and this should last all day – what is it about 40 ounces? We were only about 40 miles from Kingman by now and I must admit I was feeling a little disappointed. This was not at all what I had envisioned. I was expecting a lot more abandoned stations, derelict automobiles and roadside diners and motels. There was next to nothing once we cleared the Seligman town limits. Just as I was feeling “woe is me” we pulled into the Hackberry General Store. When the interstate bypassed Route 66 it left Hackberry, an old mining town, stranded 16 miles from the new highway and Hackberry became a ghost town. 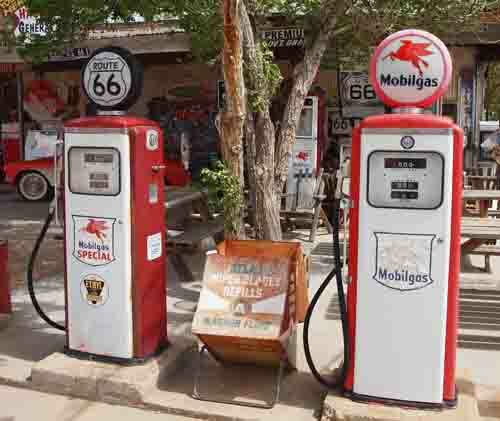 However it, the general store property in particular, is a jackpot of nostalgia and memorabilia – a Route 66 goldmine. The store and surrounding property is absolutely stuffed with old vehicles, gas pumps, signs, cattle skulls, license plates and car parts; this made the day worthwhile and then some. I bought a pair of “get your kicks” socks then asked the cashier, “Did you take everything that was ever found on Route 66 in Arizona and bring it here?” She explained that the owner was 70 years old (an old man she actually said – right in front of me) and came here from Tacoma, Washington 15 years ago. He brought his entire lifetime wealth of Route 66 paraphernalia with him and this fabulous display was the result. When I stepped out of our car when we arrived the signs were blowing in the wind, the trees were rustling and the tumbleweeds were rolling across the vacant, sandy parking lot. All I could think about was “Psycho.” Where’s the Bates Motel? As we prepared to leave, the clouds blackened and rolled in thick and heavy. It actually started to rain and I was thankful because I felt sure it would snow. Hackberry is the kind of town you could pass right by if you weren’t paying attention. Make sure you don’t do that! 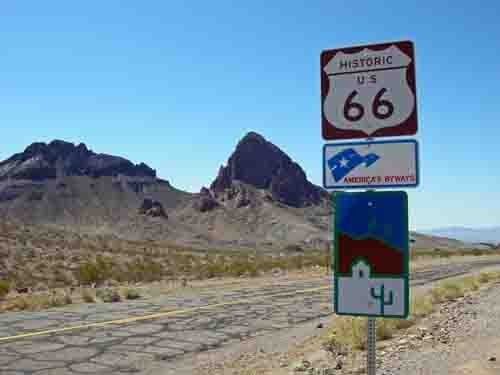 Route 66 from Kingman to Oatman was one of the most awesome drives I have ever undertaken. The desert landscape quickly turned to mountains and it was just so captivating that it was difficult keeping our minds on the task at hand – that being trying to stay on the road. Luckily it was not busy at all and for the most part there was no one in front of us or behind us for as far as the eye could see. It was an incredibly interesting and fun drive full of switchbacks and hairpin curves as we entered the Black Mountains. My friend Murray was driving and had his hands full navigating this very difficult course. At one point he enthusiastically read out a sign, “No trespassing. No problem!” We climbed steadily to Sitgreaves Pass at 3,550 feet then made a dizzy, spiraling descent into Oatman. 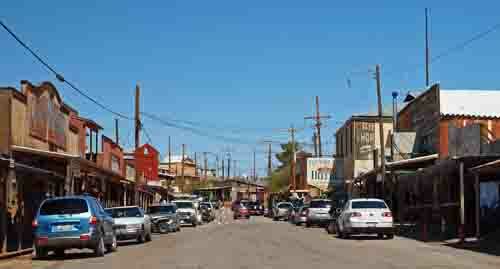 Oatman is an authentic Western town born in 1906 as a mere tent camp. It flourished as the centre of gold mining in the region then was dealt a near fatal blow in 1942 when Congress declared that gold mining was no longer essential to the war effort. 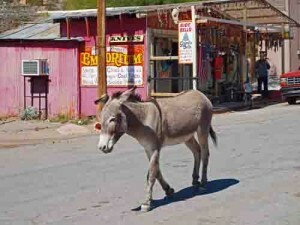 Oatman now receives over half a million visitors per year drawn by its location on Route 66 and its rich mining history. It has also been featured by Hollywood in films, commercials and historical documentaries. 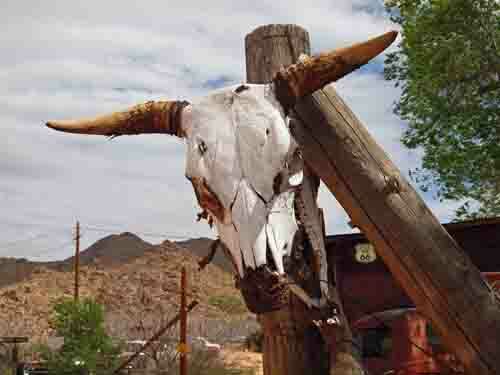 They take pride in keeping their town as authentic as possible providing a look back to the Wild West. Today Oatman is a bit of a tourist trap but it is done in such a satisfying way that you really don’t mind at all. Yes there are lots of souvenir and gift shops but the place reeks of history. It was a shame that there was a power outage when we were there. It would have been nice to see the old hotel but I felt especially sorry for all the vendors missing out on a day’s worth of sales. This was their livelihood and it would hurt. Wild burros freely roam the street in Oatman and can be hand-fed carrots and “burro chow” available in nearly every store in town. They are charming and as long as people feed them they will keep eating. They appeared to be content and were obviously well cared for. The burros are normally gentle but they are wild and there were signs posted warning people to exercise caution. They are descended from pack animals turned loose by early prospectors and today are protected by the Department of the Interior. We were not really in a hurry but it was 11AM and we had a good six hour drive ahead of us so we could not stick around for the gunfight at high noon. On the way out of town there was a pack of about six burros on the side of the road. We stopped to check them out and one wandered up to the car looking for a handout. Not content with an apparent “no” for an answer he proceeded to stick his head in the window. I grabbed my camera and asked both Murray and the burro to smile. A nostalgic and scenic 22 mile drive brought us to the twin town of Topock and Golden Shores. Here “golden” referred to years not minerals. There were a lot of retired people living there and I must confess I was not sure why. There was the charm of Route 66, the Colorado River and the mountains but it was still in the middle of a merciless desert – dry, hot and not a lot to do – interesting choice. It is there that Route 66 ends in Arizona. Much more by this author on his own website.